Piano literature written post-1970 in Australia demonstrates similar trends obvious in contemporary composition evident in other countries. By examining this literature we can discover directions that influenced composers of the later part of this century. This study concentrates on compositions for solo piano by Australian composers written between 1970 and 1998. 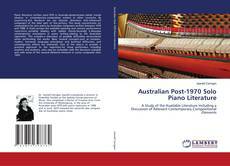 It firstly surveys the available teaching and concert performance repertoire, primarily dealing with stylistic trends.Secondly it discusses contemporary innovations in piano writing relating to the Australian repertoire. This includes a discussion of possible difficulties encountered when performing the works. Basic musical concepts such as notation, rhythm, harmonic language, articulation and technical difficulties, and contemporary effects are examined. One of the aims is to provide a practical approach to the repertoire for those performers, including teachers and students, who may be unfamiliar with the literature available and with some of the musical elements inherent in scores composed after 1970.